Stu Rothenberg of the Rothenberg Gonzales Political Report and Jill Lawrence of USA Today join Ken Rudin for a look back at the giants in the political world who passed away in 2018. Join Ken Rudin and an all-star lineup of political reporters, commentators and special guests for a full hour of analysis of the 2018 midterms. We remember the life, career, and legacy of John McCain, the Arizona Republican senator who died at the age of 81. Ken speaks with several of McCain’s close friends and colleagues, as well as several journalists who covered him closely. Part 3 of our three-part series, 1968: 50 Years Later. Richard Nixon stages a political comeback. Segregationist Gov. George Wallace mounts an independent presidential bid. And a conflicted Hubert Humphrey breaks from LBJ and gives a televised speech opposing the bombing in North Vietnam. Days before the election, President Johnson stops the bombing in an effort to boost peace talks. Nixon holds on to narrowly win the election. Part 2 of our three-part series, 1968: 50 Years Later. The Democratic National Convention gets underway in Chicago, but there is turmoil both inside the hall and outside. Anti-Vietnam War demonstrators and police clash violently in the streets. The Chicago Eight are charged with conspiracy and incitement to riot. Meanwhile, inside the hall, floor fights between establishment and anti-war delegates threaten to tear the party apart. Vice President Hubert Humphrey secures the nomination despite having not competed in any primaries. Part 1 of our three-part series, 1968: 50 Years Later. After a disappointing result in the New Hampshire Primary, President Lyndon B. Johnson drops his bid for re-election. The Gene McCarthy campaign is furious as Bobby Kennedy enters the race. On the Republican side, Richard Nixon launches a political comeback. The nation reels after the tragic assassination of Martin Luther King, Jr. in Memphis. And the assassination of RFK on the night of the California primary sends the Democratic Party into a tailspin. Stu Rothenberg of the Rothenberg Gonzales Political Report and Jill Lawrence of USA Today join Ken Rudin for a look back at the giants in the political world who passed away in 2017. We mark our 200th episode by asking, “What does it mean to be a political junkie?” We discuss with Democratic pollster Anna Greenberg, political analyst Stu Rothenberg, former Sen. Alan Simpson (R-Wyo. ), and Sacramento Bee editorial cartoonist Jack Ohman, and we share comments submitted by our listeners. 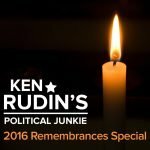 Stu Rothenberg of the Rothenberg Gonzales Political Report and Jill Lawrence of USA Today join Ken Rudin for a look back at the giants in the political world who passed away in 2016. Join Ken Rudin and an all-star panel of political reporters, commentators and special guests for a full hour of analysis of the final days of the presidential campaign. Plus, Ken and his guests cover the key Senate and gubernatorial races of interest from across the country. Join Ken Rudin for a review of many of these great moments from past presidential debates, with commentary from several journalists and historians on how those moments may have helped pave the way for the winner to reach the White House. 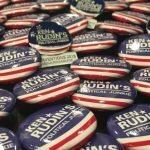 Join Ken Rudin on a journey through political history as we revisit memorable and historic moments from national party conventions of the past, and consider how the role of conventions in the presidential race has evolved from then to today. Join Ken Rudin as he previews the Super Tuesday contests with journalists and analysts from across the country, and evaluates the outlook for the leading candidates of both parties. Plus, Ken looks back at past Super Tuesdays and how well they did (or didn’t) in setting the stage for the eventual nominees. Greg Giroux of Bloomberg News joins Ken Rudin for a look back at the giants in the political world who passed away in 2015. 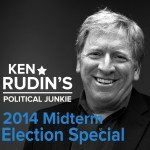 Join Ken Rudin as he pulls back from the weekly campaign coverage to take a broad examination of the 2016 presidential election in this hour-long special. He’s joined by veteran political analysts and journalists to discuss the key issues at stake, review critical moments from the campaign so far, and evaluate how the candidates are connecting with voters. Ken and his guests also examine how the early primary states gained their modern-day prominence, take an early look at noteworthy House and Senate races to watch next year, and shares answers to listener-submitted questions about the election cycle. 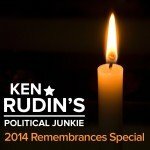 Janet Hook of The Wall Street Journal and Alan Ehrenhalt of Governing magazine join Ken Rudin for a look back at the giants in the political world who passed away in 2014. Ken and his guests cover the key Senate and gubernatorial races from across the country as the campaign season reaches the final stretch.